What follows is my brief summary of the situations we encounter most often in our Wayfarer races. Special thanks to Dave Dellenbaugh of the excellent Racing Newsletter Speed & Smarts for permission to copy and use some of his boat diagrams. I can't praise enough, Dave's explanations of the intricacies of racing to do them justice, and I highly recommend Speed & Smarts to all serious racers. The overriding emphasis on avoiding collisions remains unchanged - especially those that could cause damage. Rule 14 (Avoiding Contact) indicates that, once it becomes clear the burdened boat will not be keeping clear, the right-of-way boat shall avoid contact if reasonably possible. There is however no penalty for the right-of-way boat unless a collision that could have been avoided actually causes damage or injury. Our entire understanding of the Racing Rules of Sailing depends on our knowledge of the definitions. If there is any part of the Rules worth knowing intimately, the definitions are it. Whenever you see a part of one of the RRS in italics, that means it is used as defined in the Definitions section of the Rules. Room is: The space a boat needs in the existing conditions, including space to comply with her obligations under the rules of Part 2 and rule 31, while manoeuvering promptly in a seamanlike way. (b) room to round the mark as necessary to sail the course. However, mark-room for a boat does not include room to tack unless she is overlapped inside and to windward of the boat required to give mark-room and she would be fetching the mark after her tack. The only Rule that this new definition relates to is Rule 18: Mark-Room. (b) when the boats are overlapped, if the right-of-way boat can also change course in both directions without immediately making contact. Proper Course A course a boat would sail to finish as soon as possible in the absence of the other boats referred to in the rule using the term. A boat has no proper course before her starting signal. As we shall see below, a number of our rules require us to sail proper course when we are close to other boats in certain situations. Proper course is not necessarily the straight-line course to your next mark. It can be any course that might get you to the finish line the fastest but not a tactical course that you are sailing against the boat(s) whose presence is requiring you to sail proper course. An example of this would be a run where a boat within 2 boat lengths of me is steering a course to pass me to leeward. Let us assume that boat establishes a leeward overlap within 2 lengths of me. While that situation exists, Leeward is not permitted to sail above his proper course. An obvious proper course here would be the straight-line course to the next mark. When I am on the Protest Committee, I tend to look for some consistency in and/or valid reason for the course - i.e. the boat claiming to have sailed proper course in the example above should have been allowing for current or sailing "up in the lulls, down with the puffs", etc. before the windward boat became an issue. Another example of a valid reason for a proper course that departs from the obvious shortest course would be the following: I am inside at the gybe mark and am supposed to gybe in such a way that I sail proper course (as per Rule 18.4). It is however, a windy day, and I wait for a surfable wave on which to gybe. Because this move reduces wind pressure (and the risk of capsize!) during the gybe, I can defend this as my proper course since it is the same course I would sail if no other boat were near by. Clear Astern and Clear Ahead; Overlap One boat is clear astern of another when her hull and equipment in normal position are behind a line abeam from the aftermost point of the other boat's hull and equipment in normal position. The other boat is clear ahead. They overlap when neither is clear astern. However, they also overlap when a boat between them overlaps both. These terms always apply to boats on the same tack. They do not apply to boats on opposite tacks only when rule 18 applies between them or when both boats are sailing more than ninety degrees from the true wind. the Two-Turns Penalty is now standard - but please note that rule 44.2 requires you to get "well clear of other boats as soon as possible" and do your turns. If you think about it for a while and/or decide to pick a nice, convenient time for your turns, your turns do not exonerate you from your foul and you are still subject to protest for the original infraction. Changing Course: Rule 16.1 states: ”When a right-of-way boat changes course, she shall give the other boat room to keep clear.” No exception except as provided by the Exoneration rule for room at marks and obstructions! And note the two defined items just covered above - room and keep clear. opposite tacks: port boat keep clear of starboard! same tack: windward boat keep clear of leeward and overtaking boat keep clear! tacking: tacking boat keep clear of a boat that is not tacking! With 8 minutes to go to the Wayfarer start, I am sailing along on a starboard tack reach about 30 metres behind the line. I meet a port tack Fireball who starts in 3 minutes. The latter bears away and goes to leeward of me. What this says to me is that, from now on, I'm going to be much more careful not to interfere with any boat that is racing - both before I start racing and after I stop racing in any particular race. We should also remember that there is no proper course before the start signal goes! This means that - subject to the limitations of rule 15 (Acquiring Right of Way) and 16 (Changing Course), even a leeward boat that came up from clear astern is entitled to luff a windward boat head to wind if she so desires (although she must do so in a way that gives windward room to keep clear). Tacking is now "defined" only by Rule 13 and remains the same in intent - but the onus has been removed from the tacking boat. The rule basically says you must keep clear of other boats while you are tacking. (little recalled fact: the tack does not actually begin until the instant you have passed head to wind!!) This rule is supplemented by Rule 15 (Acquiring Right of Way) which requires you to “initially” give the freshly burdened boat “room to keep clear” if you tack into a right-of-way position. If PL wants to tack, he can call Port Windward for "Room to Tack" (rule 20) but must do so in plenty of time to allow Port Windward to respond. If PL chooses to pass astern of S, PL must give PW room to pass astern of S also, if PW wants to do so (rule 19: Room to Pass an Obstruction). Many racers are under the mistaken impression that the rule 18 (mark-room) does not apply at a windward mark. It does not apply only in one situation at the windward mark and that is when boats are on opposite tacks! Beware of trying to tack to starboard in a crowd right at a mark to be left to port! Even if you ‘legally’ complete your tack in front of a boat but are (with any part of your boat!!) inside the Zone when you complete your tack, rule 18.3 applies. You are fouling if the other boat which is now coming up from astern and laying/fetching the mark, either has to luff above close-hauled or bear away and fails to properly pass the mark because she was avoiding a collision with the slower moving YOU! See rule 21. It is a good rule of thumb that we should avoid tacking to starboard in(to) the Zone unless we are sure you can do so well away from all other boats! Buoys to Starboard: Rule 18 does not often give you immunity to tack at a mark Thus, even if you get to the windward mark on starboard tack just ahead of another starboard tacker, you must keep clear of the other starboard tacker while you are tacking. To play it safe, what you do is briefly luff up to near head-to-wind right at the mark if there is a boat very close behind you. Once he starts to go by you to leeward, you can then complete your tack. It is also worth noting that, once you have started your tack, rule 16 prevents a boat close astern from altering course if such an alteration prevents you from keeping clear. This same approach works if you need to tack around a buoys-to-port windward mark. Hitting the mark: If you should hit any mark (forbidden by rule 31), rule 44 says that you must get "well clear of other boats as soon as possible" and do one turn including one tack and one gybe. As with a Two-Turns Penalty, if the Turn is not done as soon as possible, you might as well not have done it for all the good it'll do you in a potential protest! If, God forbid, you should hit a mark and foul another boat in the same incident, you need only do a Two-Turn Penalty, not three turns. The Two-Turn Penalty is the maximum penalty for any one incident (rule 44.1(a)) unless you "caused serious damage or gained significant advantage", in which case the One- or Two-Turn Penalty is not available to you and you must retire (rule 44.1). Luffing: If a boat is to windward of you or about to try to pass to windward, you are of course, allowed to defend your wind. However, in keeping with Rule 14 (Avoiding Contact) which forbids causing damage, and with Rule 16 (Changing Course) which requires giving the other boat "room to keep clear”, the sudden, violent luff is now decidedly frowned upon. And of course, as mentioned earlier, there is no more “Mast Abeam”. 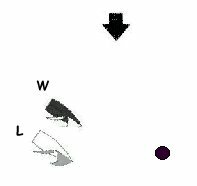 Tactically, the best approach if you are going to defend your wind is to do so before the "passing" boat gains a windward overlap. Rear-ending another boat is in the same category as rear-ending another car. No matter how dumb the other guy may have been, legally you're in the wrong (rule 12). Mark-room at the gybe mark remains much the same as it always was (rule 18). If two (or more!) boats are overlapped, the inside boat (leeward) is also the right-of-way boat and is thus entitled to make a “proper course” rounding (i.e. wide and close). However, the inside boat must gybe in accordance with the requirement to sail proper course (rule 18.4) - unless of course the wind has shifted or the course is skewed such that the second reach is very broad in which case the inside boat would be entitled to merely bear away to what she considers to be her proper course. NOTE 1: If you claim a late change in overlap status - i.e. that you established or broke an overlap just before you reached the Zone - and the other boat disagrees, you should take his/her word for it unless you have reliable witnesses to the contrary, since 18.2(e) states that "it shall be presumed" that the change took place too late! NOTE 2: The mark-room “freeze frame” that determines overlap and entitlement to mark-room, is taken at the instant when the nearest boat's hull touches the Zone. If two boats are not overlapped as they are about to round a mark, the boat clear astern must keep clear while the boat clear ahead rounds the mark except that the boat clear ahead is never given carte blanche to tack around the mark - i.e. she is always subject to rule 13 (While Tacking). A tactical (wide-and-close) rounding by a right-of-way (leeward or clear ahead) boat entitled to mark-room. If the entitled boat misjudges the rounding and leaves enough room, the other boat can try to squeeze through, remembering that the mark-room boat is entitled to sail proper course which is probably anything up to close-hauled but not beyond (i.e. you can't sail above close-hauled any more to "close the door"). At the leeward mark it is especially important to understand that you do not suddenly become the right-of-way boat just because you are inside at the mark. Rule 18 merely limits the actions of an outside boat that has right-of-way. 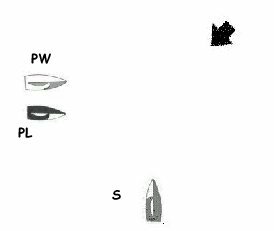 In the diagram at right, W (windward) and L (leeward) are about to round the leeward mark to port. Even though the boats are in the Zone, L is still the right-of-way boat but rule 18 limits her actions to the extent that she cannot simply cut W off and prevent her from rounding this mark (the way she would be entitled to do if this were a starting line mark). Again, boat not entitled to mark-room, can try to sneak in but leeward can sail proper course and perhaps "close the door". Beware! Rule 18.2(a) merely tells the outside right-of-way boat that she must give the inside boat mark-room (i.e. sufficient room to round or pass the mark - i.e. enough room to make a “seamanlike” rounding (close and close) as per the definition of room. In easy sailing conditions (flat water, moderate winds), a seamanlike rounding would likely be one in which W should, at all times during the rounding, be able to reach out and touch the mark. Remember that the basic idea of “overtaking boat keep clear” only applies to boats on the same tack. Thus, if you are on a port tack run, beware of the boat coming at your transom on starboard! If you are P in the picture at left, you must get out of the way, or gybe! 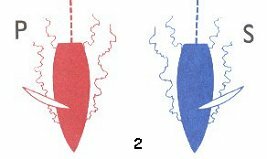 On the same tack, it is often easy to establish a leeward overlap from clear astern if you are on a broad reach or a run. If you have done this within 2 lengths of a windward boat, you must not sail above your proper course for the duration of that overlap. (Of course, a pair of gybes would start a new overlap!) You are however permitted to luff up above your proper course if by doing so you promptly fall clear astern of windward - e.g. you want to cross his transom in order to go up to windward of him. Here, r-o-w boat S is bound by 16.1 and must avoid making any course change that would not give P room to keep clear. the finish definition requires you to cross the line "from the course side". So, if the RC boat is on the wrong side of the finish mark for buoys to port for example, the requirements of the Finish definition take precedence over the buoys to port requirement. while the finish definition plus rule 28.1 state that you finish when the first part of your boat or crew in normal position crosses the line, and that the whole boat does not need to cross the line, you are nevertheless still considered to be racing until you have cleared the finish line. And as long as you are racing you are subject to being penalized for breaking a right-of-way rule or touching a mark. If this should happen to you, your first crossing of the finish line becomes null and void and you will not be counted as finished until you have properly re-crossed the line after doing your Penalty Turn(s). and don't forget, even after you are no longer racing, you are subject to protest if you interfere with a boat that is still racing - and in this case, you can't do a Penalty to atone for your sin! If you intend to protest an infraction committed on the course, there is now no need to show a protest flag on a boat less than 6 metres long but you must as soon as possible, clearly indicate your intention by yelling the actual word: "Protest!" - - - “words to that effect” are not considered clear enough! If the boat you intend to protest is too far away to hail (e.g. hits a mark 100 metres away from you in noisy, windy conditions), you must inform them of your intention to protest at your first opportunity. Unless the SI's make it mandatory, ou need not inform the Race Committee of your protest as you finish but it is considered wise, after you have finished, to draw their attention to the fact that you are protesting someone.